Cheers. MOT man did express some surprise! Needn’t be too scary - just keep to the slow lane and do one short motorway junction to begin with. Just let lorries roll past in the middle lane and I think you’ll be fine. Furthermore....when is she due another oil change? Congrats on the MOT, I would have found the shiniest poshest MOT garage possible, and rattled up in TWC, and filmed the slow stoppage of work as realization kicks in. The scariest part of a motorway in a small car isn't the speed itself, it's other motorists taking a dislike to being overtaken by a small car and treating you like a bug they want to swat as a result. You have to give everyone 4 times the space you would in a normal car, trucks "can't"/won't see you and others seem to adopt a "meh, if we crash, at least i'll be better off than you" mentality. Be careful. 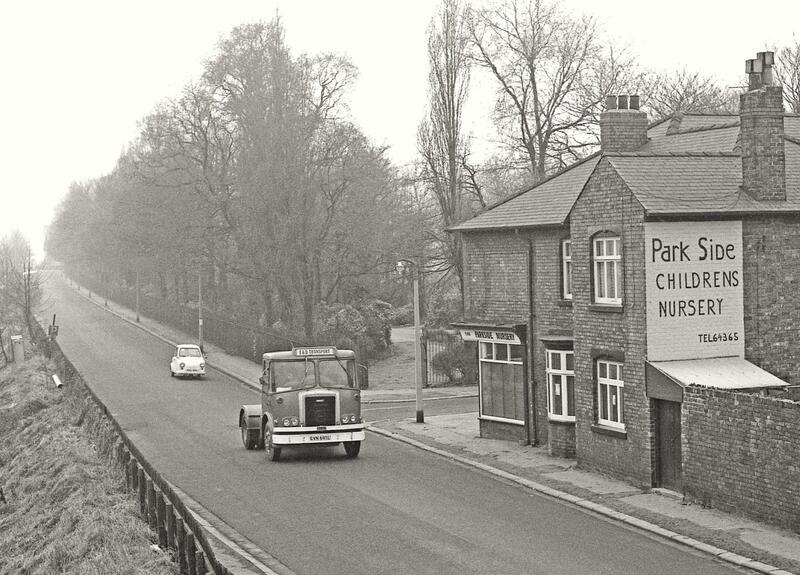 Invalid carriages were specifically banned from motorways (see the big blue sign near the slip roads, along with tractors etc). I know that it is now taxed as a tricycle, but that does not alter what it is (taxing a lorry as an agricultural vehicle does not stop it being a LGV) so I think they are still banned from motorways by law. At the very least it could be a long, time consuming and expensive court case. 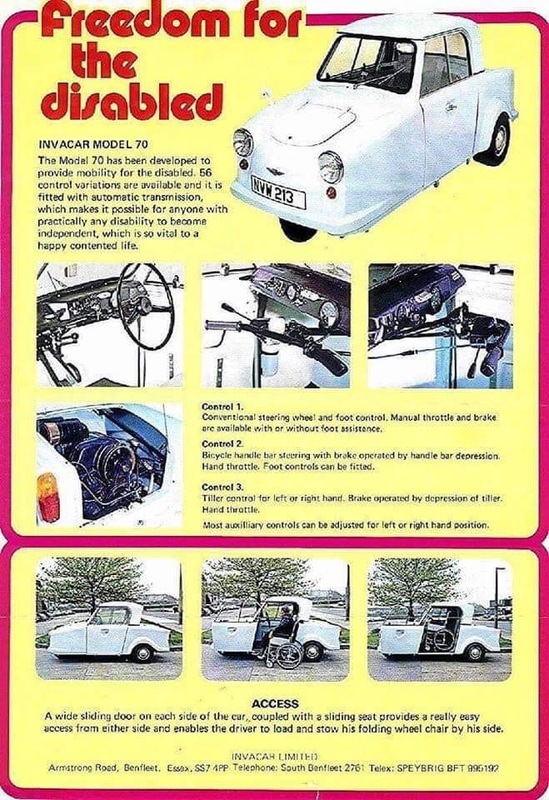 This larger class of Invacar wasn't technically part of that ban I don't think. The earlier two stroke versions certainly, and rightly, were. That said, I do know someone who was stopped by the Police in one on a motorway. They just told him to get off at the next junction. What puts me off an attempt is the fact that speed can still be a touch variable when gradients kick in. Also, it is so horrifically unstable in a crosswind that passing trucks could be a very real danger. It's just not something I'm really prepared to try. She's due a service. I have the stuff. Maybe next week. Maybe today! All invalid carriages were banned,inc the model 70,but as its now registered as a tricycle, legally you should be fine. I drive through the Roundhill Tunnels into Folkestone on the A20 every morning. Each time I do, I drive past a sign that specifically bans Invalid Carriages and motorcycles under 50cc. It always raises a smile and reminds me of this thread. Gave her a service. Well, changed the oil and checked the valve clearances - fine. Haven't got the right spark plugs it turns out, so I'll have to order some up. of course the question is how many people including the constabulary actually knew this, is why you sometimes heard stories of Model 70s being told to pull off the motorway back in the day, but there are other stories of People driving happily on motorways, including one Catholic father who drove his Model 70 from Newcastle to Lourdes and back! 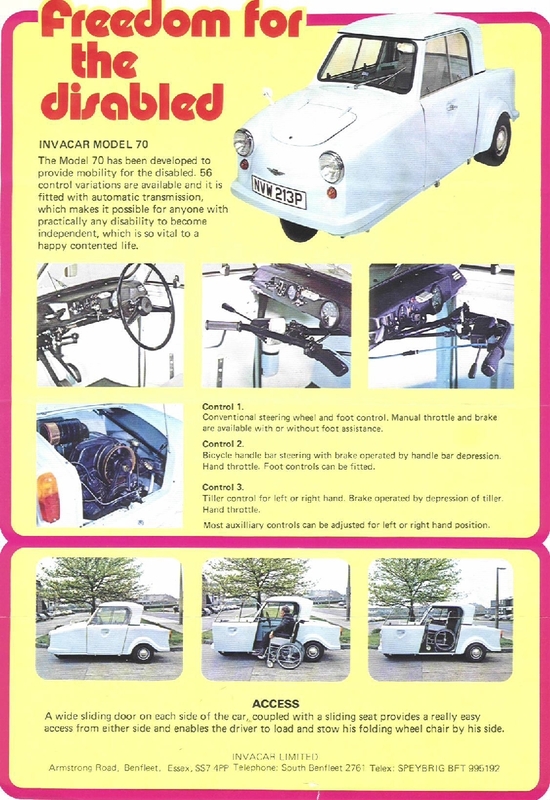 its also worth mentioning, that the only thing on the V5 of a Model 70, that alludes to it being any sort of invalid tricycle, is the body type, "invalid vehicle"
Bonus marks for filming TWCs motorway run while screaming the whole way down. "Hey dude I saw an Invacar screaming its way along the motorway today!" "No it was the driver!" Prohibited vehicles. Motorways MUST NOT be used by pedestrians, holders of provisional motorcycle or car licences, riders of motorcycles under 50 cc, cyclists, horse riders, certain slow-moving vehicles and those carrying oversized loads (except by special permission), agricultural vehicles, and powered wheelchairs/powered mobility scooters (see Rules 36 to 46 inclusive). and the fact the government at one point had 2 vehicle classes both called "Invalid carriage"
"In this Act `invalid carriage' means a mechanically propelled vehicle the weight of which unladen does not exceed 254 kilograms and which is specifically designed and constructed, and not merely adapted, for the use of a person suffering from some physical defect or disability and is used solely by such a person". If an invalid carriage exceeds 254 kg in unladen weight it will not be classified as an "invalid carriage" for the purposes of the RTA 1988, the Road Traffic Offenders Act 1988 (the "RTOA") and the Road Traffic Regulation Act 1984 (the "RTRA") and of the Road Vehicles (Construction and Use) Regulations 1986 (SI 1986/1078) (the "Construction and use Regulations"). 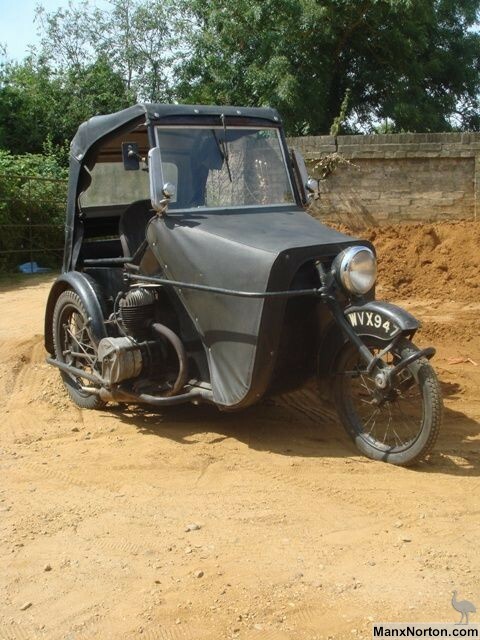 It will, instead be a motor car or, if it has less than four wheels and the weight does not exceed 410 kg, a motor cycle. So a Model 70 is classed as a motorcycle? we get a theoretical top speed of 100Mph LOL! Does the speedo on an Invacar even go to 100mph? Prosaically it does not have enough power to get much beyond 70 mph, it may even have a lower absolute top speed than the standard gearing as the higher gearing may not let the engine rev out. 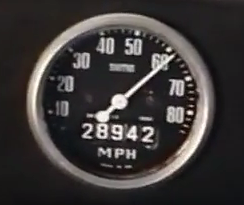 Prosaically it does not have enough power to get much beyond 70 mph, it may even have a lower absolute top speed that the standard gearing as the higher gearing may not let the engine rev out. That's certainly have it feels. She's no faster, just more relaxing - an overdrive will generally provide a lower top speed than the gear without, and some cars are fastest in fourth gear than fifth. If I could improve the aerodynamics, or slip stream a Merc Sprinter, then maybe more than 65 is possible. As it is, I don't think so. Sadly, no servicing video. There simply wasn't time. Filming stuff makes it take about three times as long, and time is not something I have much of. Haven't touched the Fox for days! One thing I'm curious about is whether closing off the area under the front service hatch would help both the overall aerodynamics and reduce the tendency for front end lift. It's something I've half a mind to investigate at some point, would quite like to have a small compartment up front I can stick a basic toolkit in and/or possibly stick the battery there to get a bit of weight there. Hopefully I'll be able to confirm or deny TP's ability to do 70 before too much longer! Realistically though, 50 feels like where she's going to be happiest. If I could improve the aerodynamics, or slip stream a Merc Sprinter, then maybe more than 65 is possible. As it is, I don't think so.